The iPhone 5s’s reliable, easy Touch ID. The iPhone 5s is the first digital device I’ve seen with a simple, reliable fingerprint reader — one you can confidently use, without a thought, to unlock the device instead of typing in a passcode. 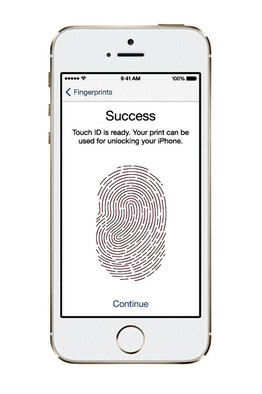 You can even use this fingerprint reader, called Touch ID, to authorize purchases from Apple’s App, iTunes and e-book stores. It sounds like a gimmick, but it’s a real advance, the biggest step ever in biometric authentication for everyday devices. After using Touch ID, I found it annoying to go back to typing in passcodes on my older iPhone. The new iPhone 5s, which starts at $199 with a two-year contract and goes on sale for all major carriers on Friday, has a beefier processor that Apple says can double its performance. And it has a better camera. Then there’s the new operating system on this phone, called iOS 7. Its new look, new user interface and new functions represent the biggest overhaul to the iPhone’s core software since the original model launched in 2007. Nearly everything has been improved, including multi-tasking, notifications, access to common controls, email, Web browsing and Siri. Like any big change, it’s a shock at first, but I have come to like it and consider it a step forward, despite a few issues. The new iOS 7 won’t just be limited to the 5s, or Apple’s other new iPhone, the $99 iPhone 5c. It’ll be a free, optional download starting on Wednesday for many older model iPhones and iPads. After a week of testing the iPhone 5s, I like it and can recommend it for anyone looking for a premium, advanced smartphone. 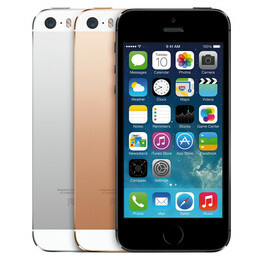 If you are an iPhone fan with any model older than the iPhone 5, the new 5s will be a big step up. If you own an iPhone 5, there’s less of a case for upgrading, unless you want the fingerprint reader and improved camera. You can get the new OS free of charge. iOS 7 has simpler-looking icons. The Touch ID fingerprint sensor is built into the iPhone’s familiar, round Home button. To use it, you must first set up a passcode as a backup and then go through a brief training session for each finger you want to use. There have been laptops and at least one other phone with fingerprint sensors, but they have generally been unreliable and people tended to stop using them. Apple is using a different technology that turns the Home button (which still performs its usual functions) into a rapid, accurate finger scanner. A steel ring around the button detects your finger and then a sensor scans it. This sensor can identify your finger even if it’s off-center or when the phone is in any position. It looks beneath the outer layer of skin, a capability Apple says means it won’t work with dead tissue, such as a severed finger or a plastic fingerprint imprint — favorite security workarounds seen in the movies. The detection process only takes a second or two. In my scores of tests, with three fingers, the reader never failed me and none of the 20 or so people I asked to test it was able to unlock the phone. If a finger match fails three times, the phone offers you a chance to type in your passcode instead. After five failures, it requires the passcode. Apple says the odds another person’s finger would work are 1 in 50,000, versus 1 in 10,000 for breaking a four-digit passcode. The iPhone 5s boasts something called a 64-bit processor, which means the system can process data in bigger chunks, and thus much faster. But I didn’t notice any dramatic speed improvement, partly because few apps have yet to be rewritten to take advantage of it. The new camera is still 8 megapixels, but has a bigger sensor that allows for larger pixels that can capture more light and color information. It has a lens that lets in more light and a flash that allows for warmer tones in low light. All my pictures were slightly sharper than on the iPhone 5 and low-light pictures were much less washed out by the flash. The camera app has been improved, with a new burst mode that takes many shots quickly and then picks the best ones, and a slow-motion video feature that lets you choose parts of an action sequence to slow down. It worked seamlessly. Voice calls were excellent, even over Bluetooth in a car. I didn’t do a formal battery test, but the iPhone 5s lasted a full workday, including one day where it still had 15 percent of battery left after 14 hours. 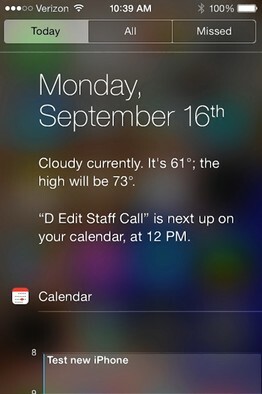 iOS 7 gives an overview of your day, such as weather and schedule. There are too many new features in iOS 7 to list here, but it’s a big improvement. The icons have been redesigned to be flatter and simpler, but they appear to float over your wallpaper, giving the effect of depth. Many elements are translucent, subtly changing shades to match the wallpaper color. The fonts are sharper, finer and more delicate. Buttons and controls are thinner and lighter and, in the browser, they disappear or shrink to make a little more room for content. Overall, the effect is to make the 4-inch screen seem larger. Any app now can be set to update in the background, though the system learns the ones you use most often and updates them intelligently to save battery. The phone now shows you thumbnails of every running app and you can quit any of them by just flicking upward, as in Palm’s now-dead WebOS operating system. 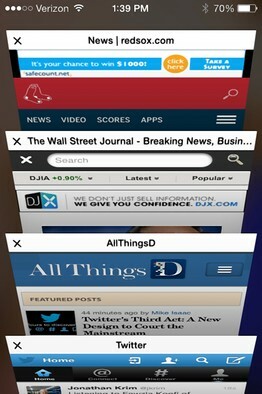 The browser shows a stack of open tabs. The notification panel, which pulls down from the top, now gives you an overview of your day, including weather and schedule. And, taking a page from Android, the iPhone now has a quick-settings Control Center that pulls up from the bottom to control Wi-Fi, Bluetooth, music, brightness and other features. It even can turn on a flashlight function. The browser gives you a handsome graphical view of open tabs and the email program now downloads thousands of messages at once, letting you mark them all as read with a few clicks. I found Siri to be more accurate and useful. It now has an almost human voice and can glean answers from Bing, Twitter and Wikipedia. The photos app now automatically groups your camera roll by time and place. You can send photos with one tap to other iOS users nearby. In iTunes, there’s now a Pandora-like radio feature.